I have a love/hate relationship with the Alien franchise. The first three movies I absolutely adore. It’s the more recent crap that I hate. The games are pretty fantastic too, with the Aliens arcade game being one of my absolute favorites. It’s just a shame that the AVP movies, which should have been a slam-dunk, were so terribly mishandled and felt more like knock-offs than anything that was a worthwhile addition to series canon. You can imagine my delight when Ridley Scott was proposing to do a prequel to Alien. The originator of the series back for another go-round? Yes, please. Of course, you can imagine my disappointment when the reviews started pouring in and sadly, I didn’t get to see it in the theater as expected, instead I opted for the dvd release. Sometimes, I think the internet just complains to hear themselves complain. Was it a perfect movie? No. Was it a fine addition to the series? Yes. Did I enjoy it? Hell yes. The film takes place years before the original, dealing with a ship called the Prometheus that is seeking the Engineers, who apparently are responsible for all life on earth and are the space jockeys from Alien. They find the planet indicated by ancient cave paintings and before long, there are some monsters running around and the scientists begin to realize that sometimes it’s best to let some knowledge stay unknown. It’s got a pretty sweet cast, featuring Idris Elba, Noomi Rapace, Charlize Theron and Michael Fassbender and they do quite well with the material, making us feel like we’re exploring the alien world with them. Fassbender in particular is quite fantastic. Indeed, I could watch a movie of just him going about the ship while everyone else is in hypersleep, as he does in the opening of this one. He’s just that good. Plus, it sort of gives me that Wall-E vibe, and that is always a good thing. After hearing from most reviewers how the movie wasn’t really a prequel, I wonder after viewing how they came up with that assumption. Prometheus clearly sets up events from Alien, though perhaps not as directly as they might like. It was enough for me and you can make some leaps to connect the two films without assuming anything wild, leaving more open to imagination. Indeed, The Thing prequel lead more directly into the original and was pretty roundly criticized for it. This one leaves a little more leeway without going post to post, especially since they’re on a different planet. I didn’t mind it at all, really. The inability of the people to turn left annoyed me (you’ll see) but for the most part they acted rather humanly, especially when Charlize refuses to let an infected person on board the ship, doing what Ripley tried to do but was overridden. I think it’s a worthy addition despite its flaws (moving at almost too brisk a pace and leaving a few plot holes), though maybe I have just been beaten into the ground by AVP. God, those films were terrible. Totally agree! I adore the Alien movies, in large part because of Sigorney. AVP just makes me sad. 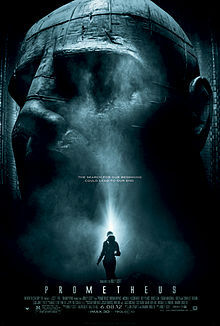 I liked Prometheus and thought the casting was great but overall it felt rushed. I felt like there was a lot jammed in there, as if there were two separate really interesting stories to be told. I can agree with that. The AVP movies were abominations, though I did like the Glaive-like weapon the one predator used. Sadly, that is the only thing one can really recommend about them.